I have a very simple card to share with you today. I often run across single layer cards that are just so clean and simple, so this time I decided to try doing the same using my handmade crochet flower. I hope you have a wonderful weekend... thanks for stopping by! 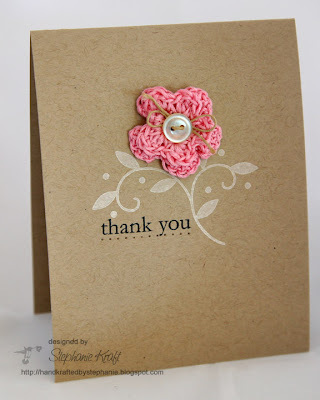 Accessories: Handmade crochet flower, Embroidery floss (DMC), Button (Papertrey Ink), Twine, Paper piercer. Simple, but yet Beautiful!! I love the flower. I absolutely love how simply beautiful these are! Saving them to my favorites!